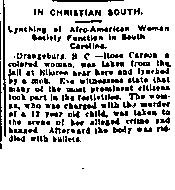 Killed July 12th, 1914, near Orangeburg, South Carolina. In some news accounts, Rosa’s last name is listed as Carson. Richardson was removed from jail; no investigation or discipline resulted, although one article noted that “several prominent citizens” participated in the lynching.